Before I picked up this book, I was REALLY struggling with the basics of crochet (I blame my knitter's mind). I had watched multiple videos and consulted several different books, but for the life of me, I just couldn't get the hang of it. This was the guide that helped break through the cloudiness of getting my crochet projects started. 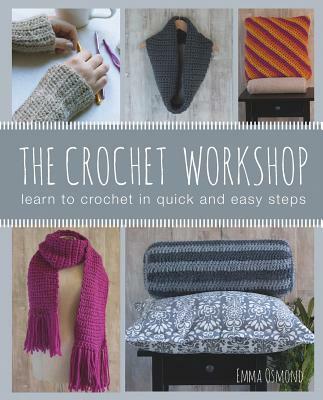 With helpful pictures and step by step guidelines, The Crochet Workshop is a perfect guide for beginners, or makes a handy reference book for experienced crocheters as well. Beginners and experts alike will also have fun with the included patterns--I can't wait to try the striped bolster pillow! Ideal for the absolute beginner, The Crochet Workshop teaches you everything you need to get started. Follow Emmas eighteen basic stitch tutorials teaching you how to form a circle, a straight edge and working into a round. There are also basic instructions on choosing yarn and how to hold the hook. There is even a UK &amp;amp; USA stitch comparison guide, so you can follow both English and American crochet patterns. With six simple yet inspiring projects to practise, youll be crocheting in no time and, best of all, the patterns are all written using full terminology to get you used to understanding how a crochet pattern is formed. Emma Osmond teaches many courses in crochet and is highly regarded for her winning approach to starting to crochet.